The Democrats are at it again. They just keep making up stuff – trying to blame Sarah Palin for anything and everything they can dream up. Why? It’s simple. She is the single greatest threat to their and Obama’s agenda to transform this free nation into a socialist state. Sarah Palin is the one Republican who can defeat Obama in the 2012 presidential election. So they want to take her down. And they’ve tried every hook and crook, every smear and lie, they can dream up to discredit Sarah Palin. Their poison barbs go out over the Internet on a daily basis. Some are outright lies; some border on the ridiculous. Feeling like an endangered species, Alaska progressives are tight. The Alaska Bloggers are tighter. Right after the nomination of Sarah Palin for VP, Wasilla blogger, musician, professor, and all around renaissance man, Phil Munger, threw a party at his home-the first of many. Secrecies were sworn; we were not alone in front of our computers-we had each other; Mudflats, Immoral Minority, Writing Raven, Celtic Diva, Progressive Alaska, Alaska Report, What Do I Know, and myself, Just a Girl From Homer. Documentary crews interviewed us and protected anonymous identities at the time. Add to that list The Alaska Dispatch. If you run a search for articles about Governor Palin there, you will see regular and blatant attacks against the Governor. One such attack occurred today in the form of a story by Joshua Saul about an isolated incident that the Alaska Democratic Party is trying to fan into an accusation that Governor Palin incited it. (Joshua Saul can be reached at jsaul(at)alaskadispatch.com for comment, by the way.) Saul’s article links to another biased article on the blog. It is quite obvious what is going on. Obama and the Democratic Party want to shut Sarah Palin up The Democratic Party poured a disproportionate amount of funds into Alaska during the 2008 election. And Governor Palin’s home state remains one of the targeted areas for the attacks against her. The first indication of something that didn’t smell just right was Obama’s direct involvement in Troopergate. Then just recently, his power grab at the Alaska Pipeline, Governor Palin’s signature achievement. If you want to know who is behind all the lies and distortions about Sarah Palin, follow the money. Authors at A Time for Choosing, Conservatives for Palin, Texas4Palin, and elsewhere have done just that, and have come up with some rather stunning revelations. I’ve put together a mini-bibliography of articles that reveal the coordinated attacks on Governor Palin by the liberal media, Alaska bloggers, the Democratic Party, George Soros (self-proclaimed “owner” of the Democratic Party), and Barack Hussein Obama. Those that follow the money trail are marked appropriately: $$$. Also included are articles that describe threats against Governor Palin and the Tea Party. It all adds up. Sarah Palin is the one vocal political figure who calls it like she sees it and has the backbone to stand tall and oppose the socialist agenda that Pelosi’s Democrats and Obama are trying to force upon the American people against their will. And Sarah Palin is the one political figure who has the integrity, charisma, and popular support to defeat Obama in 2012. May God grant that it be so! Are Democrat operatives attempting to bankrupt Palin? 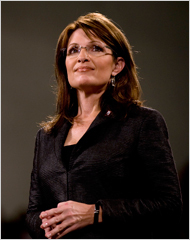 AP Digs for Dirt in Palin Autobiography; News wire assigns 11 reporters to fac..
$$$ Get Palin! Is anyone following the money? $$$ THE GRYPHEN FILES: Did Anti-Palin Blogger Get Paid For No-Show Job? Has Andree McLeod taken her Palin vendetta into a bizarre netherworld? The Media is Threatened and Scared to Death of Sarah Palin! What’s with this Palin hatred? Why did the press ignore the firebombing of Sarah Palin’s church? Why is the left so afraid of Sarah Palin? Links to additional articles can be found here, here, and here. This entry was posted on March 29, 2010 at 7:58 PM	and is filed under Uncategorized. You can follow any responses to this entry through the RSS 2.0 feed. You can leave a response, or trackback from your own site.